Object-Relational Mapping (ORM) provides many ways to retrieve data from database. Criteria is one of the efficient and easy way to query database. This tutorial will show you how to generate and use Criteria to retrieve data in Visual Paradigm. Open CriteriaTest.vpp in Visual Paradigm. 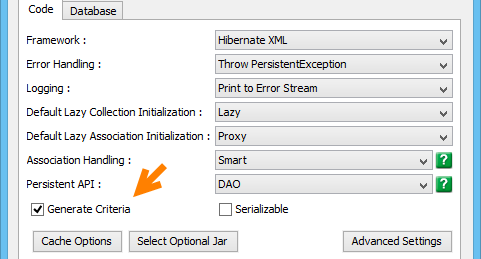 Select Tools > Hibernate > Generate Code... from the application toolbar. The Database Code Generation window appear. Keep the option Generate Criteria selected. Click OK to start generating ORM code. If you don't have any default database chosen, you are now asked to select one. Select the DBMS you use and fill in the connection settings in the Database Configuration window, and then confirm. Criteria classes are generated for each ORM persistable class. Execute the Java class CreateOrmDatabaseSchema in the generated ormsamples package to create database tables. Download the sample java code Create.java. You can also find this file at the bottom of this tutorial. Execute the Java class Create to create sample data. + dateFormat.format(listOrder[i].getOrderDate()) + ", "